Archaeological excavations at the site of a former plant nursery, set to be developed for housing, have found evidence of Iron Age and Roman use. The dig at the former Unwins Nursery at Impington, Cambridgeshire, found occupation dating from about 100BC with evidence of an Iron Age roundhouse. The site was developed in Roman times with a series of ditches and pottery found is from the 2nd and 3rd Century. The finds include high status Samian pottery imported from Gaul. Some of the Samian pottery has the potter's stamp still visible, enabling archaeologists to find the actual individual who made the vessel about 1,800 years ago in France. Also a deposit of more than 40 oyster shells intermingled with pottery has been recorded in a pit close to the existing road. This may represent a ritual or votive offering to the gods or ancestors. 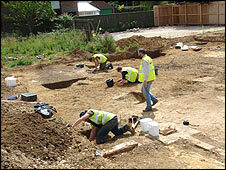 Site director with Oxford Archaeology East Chris Thatcher said: "We did not expect to find such important Iron Age and Roman remains here at Impington. "We can now see the origins of the village going back over 2,000 years." The planned redevelopment of the site will see the building of 35 houses.